This weekend past we attended the official opening of the West Head Army Battery on Sydney's Northern Beaches. What was terrific about walking through history last Saturday, was that there was a living link with the battery in attendance, by the name of Bluey Mercer. Bluey had been a soldier serving at the battery in 1941 and 1942 and he was there to cut the ribbon. This made the experience really special, as with most history, most of the players are long gone. So it was a real thrill to hear some of the stories from 93 year old Bluey about how they went about defending Pittwater and the Hawkesbury Railway Bridge, which was the main link to move troops north to Brisbane and beyond in the defence of Australia against the Japanese. Unbeknownst to the Australian population at the time, there were also German Raiders operational off Sydney and Newcastle laying mines in the hope of sinking ships, which they did. Bluey interestingly said one of the main reasons he and his mates joined up as volunteers, was the ready supply of food the Army provided. He said being a boy growing through the Great Depression, where food was always scarce, had been very difficult, because he was always hungry and needed so much food at that age. He said food was a great motivator at West Head too. The army cook had previously been a pastry chef and motivated them to work in this incredibly difficult steep environment to get the West Head defences operational. They worked very hard because they knew they would be treated with cup cakes, fruit cake and all sorts of pastries, if they did a good job. The very unpopular job of collecting wood for the stoves was always over subscribed with volunteers because they got the pick of the sweet treats. They do say an army marches on it stomach and Bluey's story backs that up. The battery consists of an observation post (the highest of the 3 surviving structures) and 2 gun casings, which held 1 x 4.7 inch guns each. The guns were lower to reduce the amount of ''dead water" when firing. That is the water between the shore and the enemy craft which a firing gun cannot reach with a big fixed gun. That's why the guns are at the base of the cliff instead of the top of it, in case you were wondering. 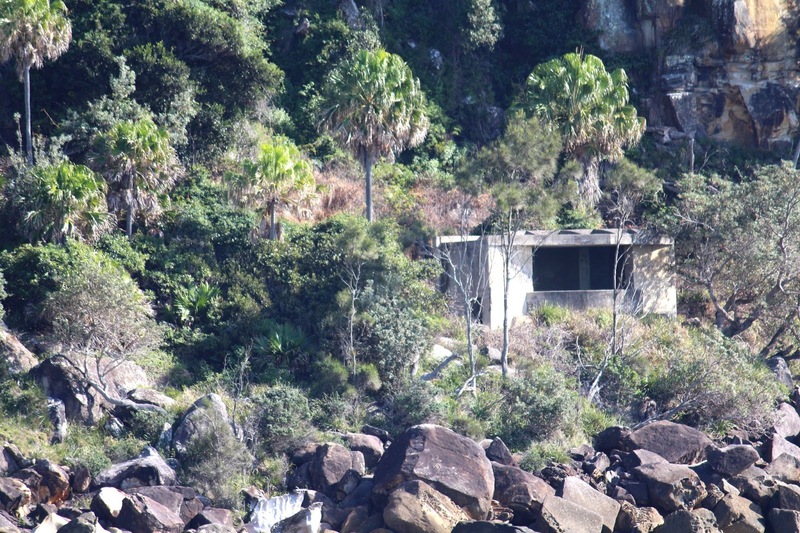 The search lights, generators (the mangled concrete at the top of the stairs marks the location of the generators) and administrative offices were located at the top of the cliff. A fabulous model of the West Head Battery with the observation post, the two circular gun casings, the picket hut (centre right) and the ammo dump left of the hut. You can also see the steep railway track cutting to the left. Also the horizontal railway track connecting the two gun casings and the picket hut. One of the gun casings at the base of the cliff. 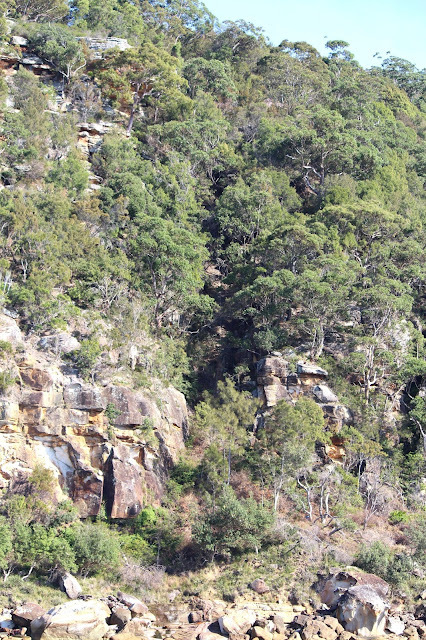 You can just make out the old railway track cutting in the cliff. And here's a model of the railway that once ran through the cutting, to lower concrete for gun casings, the gun pedestals (7 tons), the 2 big 4.7 inch guns, ammunition and many other supplies. Apparently one 7 ton pedestal crashed down the cliff, flipping the counter weight of the railway up and over the escarpment. The pedestal was damaged and needed to be repaired before the guns could be placed on top. Part of the pedestal in it's position in the gun casing. The location of the horizontal railway today, which has been reclaimed from the bush. On top of West Head the Reenactment Regiment makes ready for the opening ceremony. Traditional indigenous owners, descendants of the army personnel and interested residents like us, gathered for the start of the ceremony. The stone steps are quite steep in parts. Fine on the way down, but a challenge on the way up for the unfit. The northern gun post overlooking the opening of the harbour where 5 bodies of water meet. The recently built ladders and viewing platforms, centre left and the observation post centre right. The cliff like terrain the soldiers had to conquer during the construction and operation of the battery. In hindsight it seems like a posting to the West Head Battery during WW2 was a good one in the scheme of things. However, at the time, the soldiers did not know what was coming and there was a real fear that the enemy could land an army on the many beaches of Pittwater and take Sydney from the north. In 1941 there were two German Surface Raiders named Pinguin and the Passat, which managed to lay mines off Sydney, Newcastle, Adelaide, Perth and in Bass Strait to sink and damage merchant ships off the coast of Australia. This action lead to several ships being sunk and up to 10 hands being lost and major disruption to merchant shipping off the immediate coast of Australia. These losses were not known by the inhabitants of Australia at the time, as the authorities did not want to create panic. Apart from the tragic loss of life the Pinguin and Passat caused, this also meant the shipping lanes around southern Australia had to be closed until it could be worked out by the authorities what was going on. By the time they knew it was a pair of German Raider, rather than a U boat the raiders were long gone. Also the terrain was very difficult and Bluey said they worked very hard, but they had good leadership. Their commanding officer was like a father figure to them with a good plan to set up and operate the battery. Thank goodness there was never a shot fired in anger from the battery and thanks to the enduring nature of concrete, we can still get some idea of what these young men went through. It leaves me wondering whether you could get a group of 18 year old young men to do the same today. I hope we never get then chance to find out. Next time they should send the politicians first. That would be a sure way to end war. Or perhaps put the women in charge. What a really interesting place to visit. Love to hear about all these stories of life and what happened in Australia. Lovely post. I have visited West Head on a couple of occasions but didn't know it's military history. I live near the South Head batteries and was lucky enough to do a walk through the tunnels on one of the rare occasions they were open. 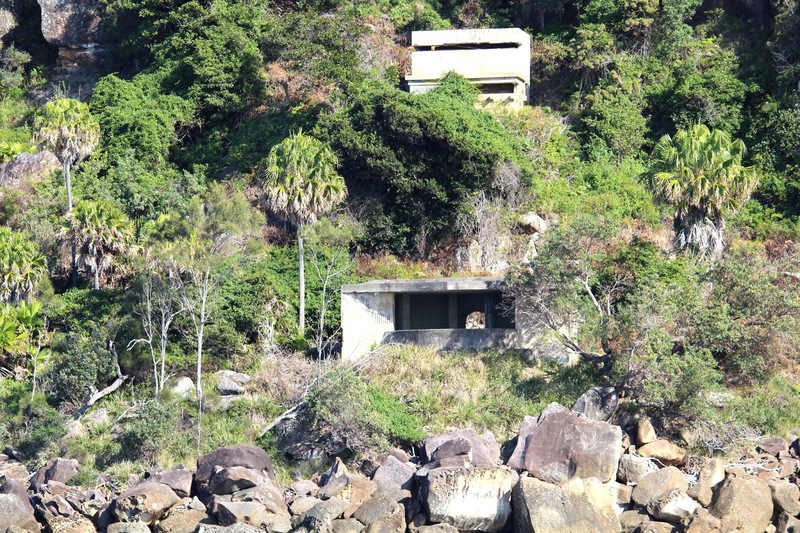 I have big gun emplacements outside our backyard but unfortunately the guns have long gone. Always love finding out more about the history of a place. I knew there were Japanese subs in Sydney Harbour during the war, but didn't realise the Germans were so close too! It looks beautiful, and how wonderful to hear the history of the area. Thanks for sharing with us. Since I've always been so fascinated about Australia this post is incredible. Loved all your excellent photos, so clear. Enjoyed hearing about Australia's history about the "great war" as it's been called. How wonderful that one older gentleman is still alive to take part in that ceremony and event, to tell his stories. I have read that Australians were in war but not that the war was right off shores of your country. I will come back to see photos and read your text again. By the way who is that handsome young man in your photos, is he about 10 or so? Thanks for your visit. He is my son who is really interested in military history just like his mum. @ srpprcrftr "The Great War" referred to The First World War not the Second. Visiting West Head these days with its stunning views it's hard to imagine what it would have been like for the soldiers all those years ago. Thanks for sharing a little of the history surrounding this area. Stunning pictures and it looks like an amazing reminder of our history. I've seen similar places in Singapore and East Timor - overlooking the ocean I guess. Wow! What an amazing day and what a great history lesson. Fantastic Caro, I am going to link to this in a wee post I have on West Head. Must get up to see this history lesson in real life. Fantastic, so glad you were there to tell the story.